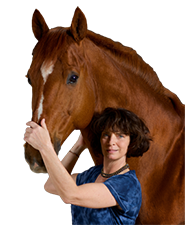 Unmounted 1-hour and 2-hour Body Awareness Workshops and Lectures – Discover how your body’s ability to move or not to move has a direct and distinct effect on your horse’s way of going. Discover the secret to following the movement of a sitting trot or canter. Learn how to keep your legs still. What is a core and how to you use it? What is a weight aid? These and other riding mysteries are explored and solved. 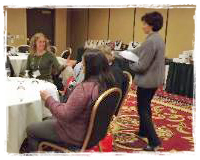 My interactive workshops are fun and educational no matter what level of rider you have in your group or what discipline you follow. They can be tailored to fit the specific need of your group or club. Mounted Body Awareness Clinics – Take your understanding of how your body influences your horse one step further. I assess how your body does or doesn’t move with your horse by watching you ride for a short time. (I love to include auditors in this process.) Then, you will dismount and we will work on specific exercises and skills tailored to your specific body issues. You will then remount and we will reassess how your body is now synchronizing with your horse’s. This process is then repeated; concentrating on the areas in your body that need attention. My goal is to produce a happier, more willing horse (and rider) by alleviating the issues in your body which are negatively affecting your mount. 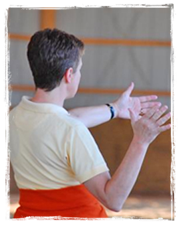 “What is Dressage” Lecture – This lecture can be customized to your group – either non-horsey or horsey. Learn the basics of dressage, its history, how competitions work, how they are judged, and how the horse is trained. We review the Training Scale, a variety of dressage tests and view competitions highlighting upper level movements and the freestyle. 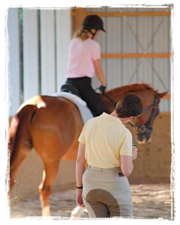 Traditional Dressage Lessons and Clinics – I teach, train and coach dressage riders of every level from beginner to FEI. I help riders who focus solely on dressage, eventers who are interested in better mastering the dressage phase of their training program, as well as hunter/jumper, western and saddle seat riders who understand that good flat work will improve the quality of their chosen sport. 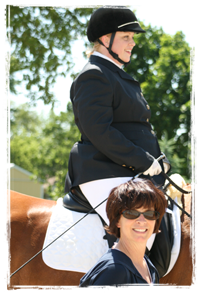 Coaching - Jennifer accompanies students to horse shows and clinics and provides help with warm-up and in-ring strategies. Most importantly, she acts as a mentor, cheer-leader, psychologist and friend. Private and Group Pilates for the Equestrian Athlete – Available at my home, at a Pilates studio in downtown Chicago or at a location of your choice, I offer traditional Pilates classes and Equilates-inspired classes for both individuals and groups. My specialty is working with people who are in need of body re-education and rehab and athletes. 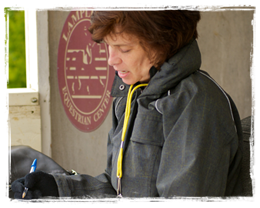 Judging for Schooling Shows – As a graduate with distinction from the USDF Learner Judges program, I am qualified to judge from Introductory through Second level dressage at the Schooling Show Level. I am available for Dressage Shows, Mini-events, Pony Club Rallies and Combined Tests.